WINCHESTER — The Griffin Museum of Photography usually mounts four discrete shows. The current exhibitions come in a pair of pairs. Brandon Thibodeaux’s “When Morning Comes” and Magdalena Solé’s “Mississippi Delta” are about that extraordinary region of the South. Bryan David Griffiths’s “The Last Bookstores: America’s Resurgent Independents” and Kerry Mansfield’s “Expired” are about books. The shows runs through March 1. He focused on five small rural communities, within a roughly 15-square-mile area: BoBo, Alligator, Mound Bayou, Duncan, and Rosedale. That’s the same Rosedale mentioned in Robert Johnson’s “Traveling Riverside Blues” and Cream’s version of Johnson’s “Cross Road Blues.” It’s a reminder that, acre for acre, this impoverished, verdant, stunningly flat area probably had a greater impact on 20th-century culture than anywhere else in the world. Either that, or the portion of Vienna within the Ringstrasse. But hard by the Danube you don’t find many beheaded snakes, pecan groves, or men named Choo Choo sitting in a field holding a Bible. Affection and high regard infuse all of these photographs, at times, perhaps, a little too self-consciously. 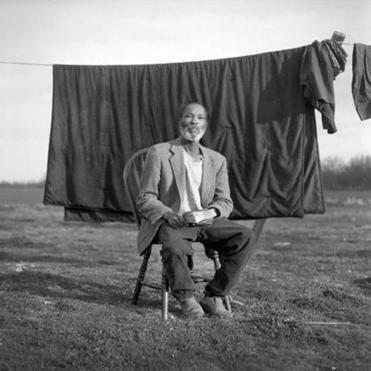 Most of Thibodeaux’s work falls under the heading of social documentary: slice-of-life images of the people who live in the Delta. The pictures are atmospheric, emphasizing local color and personality. An exception is a startlingly handsome photograph of many, many birds exploding upward from a field: Flatness with a capital F and escape with a capital E.
Magdalena Solé’s 16 photographs are in color. With their juke joints and farmhouses they are unmistakably of the region, as Thibodeaux’s are. Throughout there is a sense of vibrancy and decay intermingled. Solé’s most striking images differ from Thibodeaux’s in their painterly quality and occasional flirtation with abstraction. She has a fondness for blocks of solid color, as if Hans Hofmann had somehow wandered into this world and found it very much to his liking. Note the spattery blue background and red-orange chunk of fabric in “Girl Dancing.” These blocks bespeak a frequent unexpectedness in the pictures, as in the photograph of a decrepit blazer hanging on a rusty hanger in a space that’s at best the memory of a closet. Where Thibodeaux’s finest work strives for a monumental and universal quality, Solé’s seeks to surprise and intrigue. The title of Bryan David Griffiths’s “The Last Bookstores: America’s Resurgent Independents” is self-explanatory. It also sounds a little like ad copy. Granted, it’s a public-service ad for an excellent cause; but that cheerleader tone informs the nearly two dozen very attractive pictures in the show. Those pictures provide a reminder of what beautiful objects books are — and how that beauty increases when they’re seen gathered and various. Most of the photographs are in color. Beside bookstore interiors, Griffith presents portraits of booksellers, a children’s story hour, even a bust of Shakespeare. There are some famous bookstores on display: Powell’s, in Portland, Ore.; Elliott Bay, in Seattle; City Lights, in San Francisco. As a cheerfully sinister touch, the Transamerica Pyramid can be seen looming over the latter. 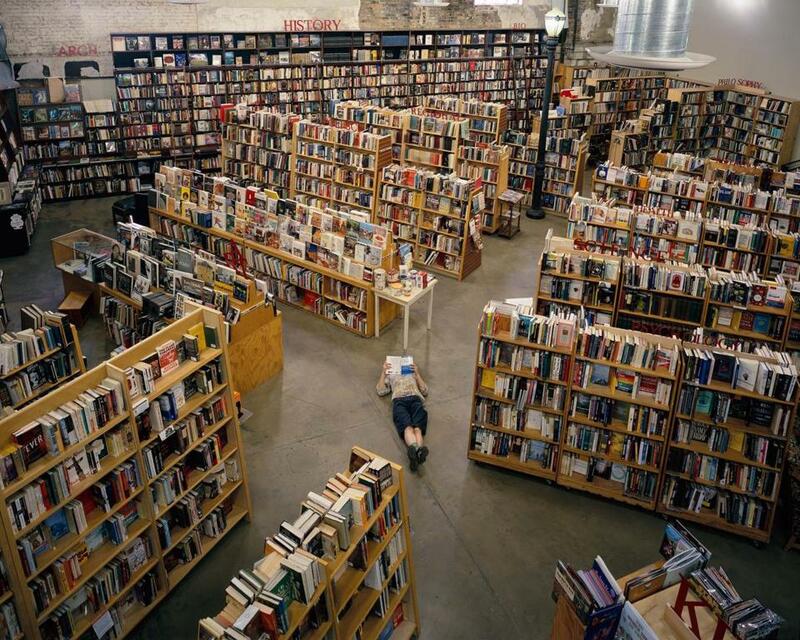 Stores aren’t the only places where books are gathered. 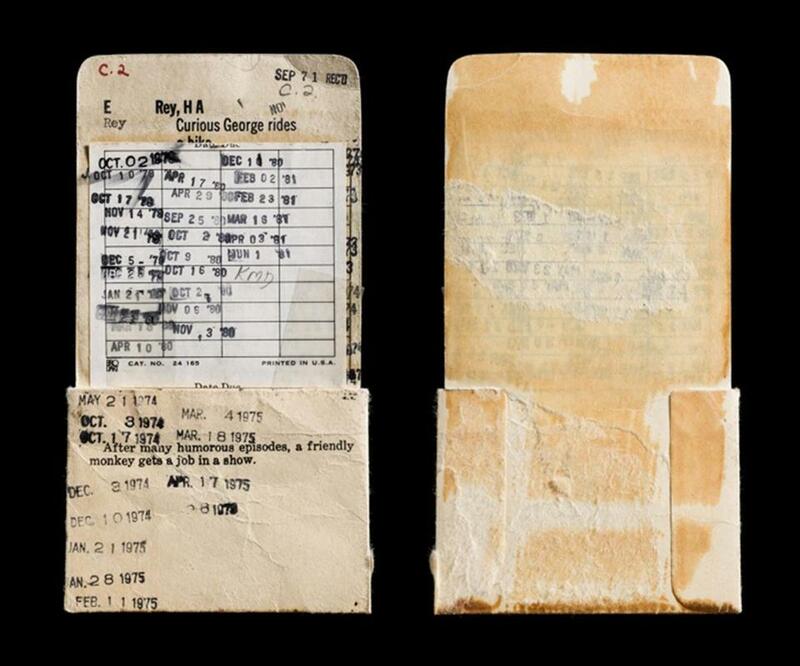 Kerry Mansfield’s quite glorious “Expired” is a small, transporting tribute to public libraries. The transporting is done on the way out, as it were. Mansfield photographs books, or aspects of books, that have been discarded. These books, she writes, “were not left on shelves, untouched.” Every smudge and tear and discoloration bespeaks myriad past readers — and an enduring poignance and nobility. Mansfield conveys a tactile quality in the tattered, battered beauty of these books. A set of Hardy Boys volumes are seen with their spines facing the camera and lined up with the exactitude of Minimalist sculpture. The many stamped dates on the card envelope of a retired copy of “Curious George Rides a Bike” have an inky aesthetic assertiveness. You might entitle their accumulation of black marks “In Search of Lost Time,” except that one’s already been taken. Small matter: Looking at Mansfield’s marvelously evocative photographs, for a lover of libraries, is better than any madeleine.